Spring Fever will be active until May 20. 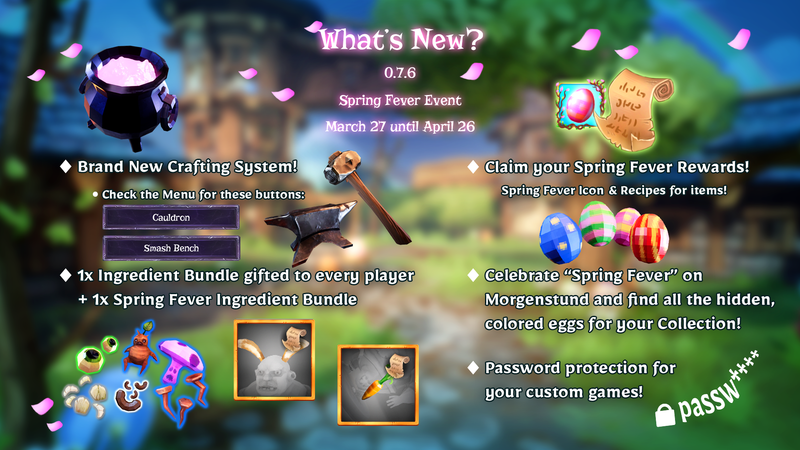 -Added a Spring Fever Player Icon, a skin item (Spring Fox Ears) and a Crystallized Moonlight bundle which are obtained by playing one round during Spring Fever. -Added: Buttons for our social media channels in the mainmenu. -Changed: Reduced health of the smaller wood slices. -Changed: The Spring Fever Event Props are currently collectable. -Fixed: Lowered the Hunter crouch camera height so it’s no longer possible to see through the roof. -Fixed: Removed clipping through the ceiling in the Hunter spawn zone on Twinmask Theater. -Fixed: Moved the Nutcrackers to the event prop category. -Fixed: Several small fixes to the Serverbrowser. -Fixed: The Jump Pad will now always apply the same upforce. -Fixed: It is no longer possible to get out of map due to the hunter transformation in Hunt a Hag. Its should now also be very unlikely to get stuck during this. Added: 3 new Valentine’s Day themed items & the return of the Valentines item from last year, obtainable until the end of the the Chinese New Year event. Added: Push to Talk for voice chat, the default key is F.
Added: There is now a slider to change the volume of voice chat. Changed: Reduced the volume of the Fireworks at the end of a round by 50%. Fixed: Players who joined the game via out of game invite would be displayed as ‘noname’ and sometimes even crash the server. Fixed: There was an issue where a Mushroom projectile would cause a player pushback when the projectile hits a garlic zone. Fixed: There was the possibility, that the server browser caused performance issues in game. Fixed: There was a bug in the voice chat which crashed the game in some cases. Fixed: Craft 10x ingredients now display their correct icons. Fixed: Attempt to fix crash which occured on Chinese language. 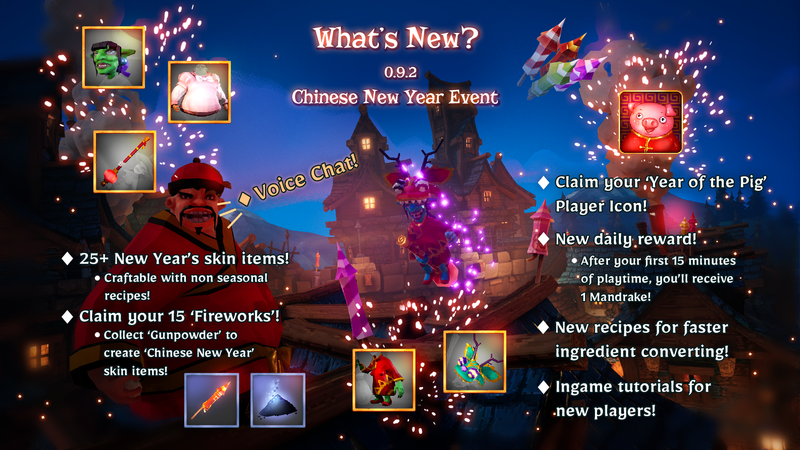 The Chinese New Year Event has begun! It will be active from February 4 to February 25. -Added: Steam Voice Chat support. The settings for the voice chat are in the Steam Voice settings. There is a new setting in-game to completely disable Voice Chat. Also, you can use the in-game mute function to mute certain players. -Added: 3 new recipes which convert 40 of the smaller ingredient to 10 more rare ingredient to make the process a bit less tedious. -Added: New Help screen, where you’ll find a bunch of new tutorial videos. Highly recommended for beginner players. which should be easier to read. -Changed: The loading of Skin item data was improved a lot. This will also reduce the hiccups at the winning screen. -Changed: Skin selection, muted players and notification states are now stored in the Steam Cloud, which makes it easier to play on different computers or play with multiple accounts on one computer. The Winterdream Festival has begun! It will be active from December 12 to January 7. Updated to Unreal 4.21.1 which fixes some minor issues. -Added: 35+ new Winterdream skin items. -Added: Snowbreeze is now available for ‘Fill a Pot’ in custom games and on official servers. -Added: Fiskersted is now available for ‘Fill a Pot’ in custom games. -Added: A few new props. -Added an option to disable jump scares, which replaces the Luaq with another effect. -Added a game option to show timestamps for chat messages. -Changed: ‘Fiskersted’ and ‘Snowbreeze’ are now decorated to celebrate the Winterdream Festival. -Changed: Decreased the visibility of the ‘Possess’ skill trail to make it harder for the Hunters to see it. -Changed: We did some improvements concerning the prop layouts used in ‘Fill a Pot’. -Changed: The chat is now scrollable. -Changed: ‘Decoy’ will now only create decoys of common Props. 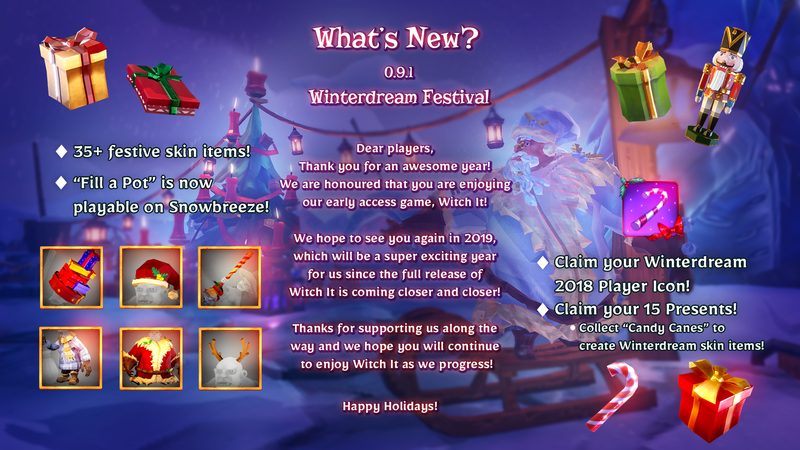 -Changed: We removed the achievements from the Winterdream Festival 2017.The related items are now craftable. Detailed explanation: The old achievements got implemented before the crafting system existed. In theory the ‘present hunt’ were funny , but it didn’t work out in practice. It interfered too much with the actual gameplay and caused frustration. That’s why we decided to remove the achievements instead of doing the same ‘present hunt’ this year. Everyone who got the achievements will of course keep their related items. -Fixed: Some Market Stand props had the wrong color after a Witch transformed into them. -Fixed: The new facial animations looked broken on ‘The Shifty Observer’ and ‘The Scheming Observer’ skin items. -Fixed: Props flipping to old sleep position for some frames. -Fixed: Attempt to fix disconnects at the end of ‘Fill a Pot’ rounds. -Fixed: The game only chooses from the languages visible under game options on startup. -Fixed: Glitching under the map while transforming into a prop with a falling witch. -Fixed: Result stats haven’t considered scalings of props. We updated the Unreal Engine to version 4.21 This should fix some bugs. Let us know if you find any new ones. We added the option to craft a Gloomkin from 30 Candies. Because of this change the Halloween Event will be extended until December 3. -Added: 50+ custom recipes. This includes recipes for the Abyssal Witch set, Captain Hunter set, Reaper Witch set, Magical Painter Witch set, wich makes these sets fully craftable through custom recipes. -Changed: Win condition of ‘Fill a Pot’. When the first Witch team fills only 0 or 1 cauldrons, the 2nd team only needs to fill 1 or 2 cauldrons to win. -Fixed: Field of View should now apply correctly to the spectator in round 2 and onwards as a custom match host. -Fixed: Server list entries now scale in size when the text is too long. This should be especially useful for the Russian localization. -Fixed: Several skill selection fixes. -Fixed: Materials of a tower in Snowbreeze have been fixed. -Fixed: Skill descriptions of Decoy and Possess. -Fixed: Result stat of Magic blocker is working correctly again. -Fixed: Physics of the Candle Stand prop. -Fixed: Votekick (custom games only) should be working as intended now. -Fixed: There was a rare case which crashed the official servers. The Halloween Event has begun! The new game mode is an objective mode where the Witches have to fill 3 of the 5 cauldrons to win the round, while the Hunters must prevent them from doing so. Join a game of “Fill a Pot” and choose your team. You will get sorted randomly into the Witch team or the Hunter team. Currently, you can play 2vs2. (We’re already testing 1vs1 and 3vs3). -Changed: Hunter AFK timeout changed from 45 sec. to 60 sec. -Fixed: There was a bug which prevented Witches from using transform after trying to transform when standing in the Garlic zone. -Fixed: Mushrooms don’t cause infinite confusion on the Hunter anymore. Changed the way Hunters get XP. Hunters get 5 XP per Witch catch and 5 XP per Witch catch assist. -Added: Doors are now destructible to prevent door blocking. -Added Team chat: Team chat is on by default. to write in ‘All Chat’ press Shift+Enter to open the chat line. -Fixed: It is no longer possible to get under the terrain with the Paddle prop. Changed: Witch HP in Hunt a Hag increased from 5 to 6.5 HP. This way a Witch will survive one hit after a ‘Heal’ Power Up has been collected. Changed: Increased cooldown of the ‘Mushroom’ skill from 1.5 to 3 sec. This way you can’t spam as many with an active ‘Mana Boost’. Fixed: Video Settings are now saved correctly. Fixed: It is no longer possible to get under the terrain with the Sunshade prop. Fixed: In Hunt a Hag only the Heal Power Up is dropping. Fixed: Opening of remaining chests is now working again. Fixed: Status message for suicided Witches is now working correctly. Fixed: Several broken spots on Pirate maps. We completely removed Magic Dust and replaced it with Power Ups for both teams. To compensate, we increased playtime xp from 20 to 30 per minute. Win xp multiplier got reduced from 50% to 25%. Overall you will receive around the same xp as before. To replace the Magic Dust we added Power Ups to the game. So far, there are 2 Witch Power Ups and 2 Hunter Power Ups. -Increases your mana regeneration rate immensely for 20 sec. -Increases the movement speed by 40% for 45 sec. -Removes stamina and increases fire rate for holding fire for 20 sec. -Added 9 new player icons for you to collect. -Changed: Optimized shadow rendering. Shadows should now cost less CPU and less GPU, which should make the game faster on older PCs. On lowest shadows settings dynamic shadows are now completely removed. The look a bit less good on highest settings. -Changed: It is now possible to activate the jump pad with Potatoes again. Changed: Mana regen rate is now also applied while Spells are in use. Mana per sec costs of all spells got increased to compensate that. -Changed the maximum search time for custom matches from 8:20 min to 10 min. -Fixed: The outer candles of the Candle Stand now flicker also. The Plunder Party Event will be active from August 17 until September 17 (16:00 UTC). Everyone will get 10 Treasure Maps which can be combined with Coins to unlock a Treasure Chest. Coins have a 20% Cauldron Drop Chance when you play on the Plunder Party maps. (There will be official Servers with Plunder Party maps only). -Added a confirmation dialog for smashing high quality Items. -Changed: Items in the Skin Selection and Smash Bench screen are now sorted by Rarity. -Fixed: Sound Volume values should not reset randomly anymore. -Fixed: Deleting the second axis key binding now works properly. We did some changes to the controller layout, please reset your controls to default in the input settings to get the new mappings! This time we reworked the ‘Magic Blocker’, the ‘Vacuum Trap’ and ‘Possess’. -It now drains 25 Mana/sec. -The duration got increased form 1 sec. to 2 sec. -Increased cooldown from 6 seconds to 8 seconds. Info: Some skills are still work in progress. More work done on the UI overhaul, everything should be navigable with controllers. -Added a delay before tooltips open. -Added a tooltip open and close animation. -Added confirmation dialogs when applying settings. -Added confirmation dialog when changing fullscreen mode and/or resolution. -Changed the main menu layout a bit. -Changed the layout of the key binding list. -Changed: Reworked Hunter and Witch Skin Selection screens. -Changed: It’s now possible to rotate the character in Hunter and Witch Skin preview with mouse and controller. -Changed: Unified grid buttons in skin selection, cauldron, smash bench, prop collection and other places. -Changed: Combined ‘Patchnotes’ and ‘What’s New’ screens. -Changed: Overhaul of the F1 ingame help screen. It will now dynamically show unique key bindings. -Added: Prop Stabilize will now toggle by default on controllers. -Added: Ambient and User Interface volume sliders. -Changed: ‘Magic Dust’ is now obtainable by using the ‘Magic Blocker’, ‘Chicken’, ‘Vacuum Trap’ and ‘Mushroom’. -Fixed: Crouching will now work properly when using ‘Hook’. -Fixed: It is not possible to duplicate props as witch anymore when using fast mouse clicks. -Changed: Removed the 100ms ‘Potato’ throw delay and also adjusted animations to reflect this change. Also, reduced the gravity scale of the Potato from 0.3 to 0.2. -Changed: Further improvements to controller UI. -Fixed: Remaining ‘Confusion’ sound effect after the end of the match. -Added prefered region into Quick Match menu. -Changed the step size for mouse sensitivity from 0.5 to 0.1 to allow finer control. -Changed: The player will now only join official servers which are 70% full at most in quick match. -Changed: Increased the amount of official ‘Mobification’ servers. -Fixed: Being confused by the ‘Mushroom’ never ends sometimes. We changed the way special ingredients drop. And a 20% chance to get an special ingredient in addition to the normal drop. This way you will get a lot more special ingredients and also get more other drops. To reflect the higher quantity of special ingredients received, we lowered their rarity to rare. -Changed: Increased size of the green coconut prop. -Changed maximum value for Motion Blur from 2.0 to 1.0. -Fixed Motion Blur setting not saving and restoring correctly. -Fixed: Game Mode selection for Custom Match now works properly again. -Fixed: Opening wrong screen when changing state Ready/Unready very fast. 1. Due to the console port we’re currently overhauling the UI to make it usable for controllers. Everything is work in progress, which means some stuff is working different than before and some things are not yet finished. 2. After collecting all your helpful feedback, we developed a plan for improving all the skills. Starting with the ‘Mushroom’ skill, we will one by one introduce updated and sometimes completely overhauled versions. As always, feel free to share your thoughts. -Added 8 new Witch Hats (which can be crafted with Summer Shells). -Added: Every map has ambient sounds now. -Added: Recipes in Steam will now show the needed ingredients in the description. -Changed: Overhauled the ‘Mushroom’ skill incl. balancing, visuals, audio. -Changed: The Prop velocity is now transferred to the Witch rag doll. -Fixed dark ‘Prop Collection’ on low video settings. -Fixed: Spectators will no longer trigger jump pads. -Fixed: Visible Hunter first person mesh in third person view. -Fixed: Field of view is now correctly set when match starts. -Fixed: Luaq forces first person view again and prevents toggle camera view. -Fixed: Flames of candles are now correctly attached to the candle as client prop. -Fixed loading and saving of selected witch skin, hunter skin and player icon. The time for bonus drop rates for the ‘String’ (Theatre item ingredient) got extended until June 13. 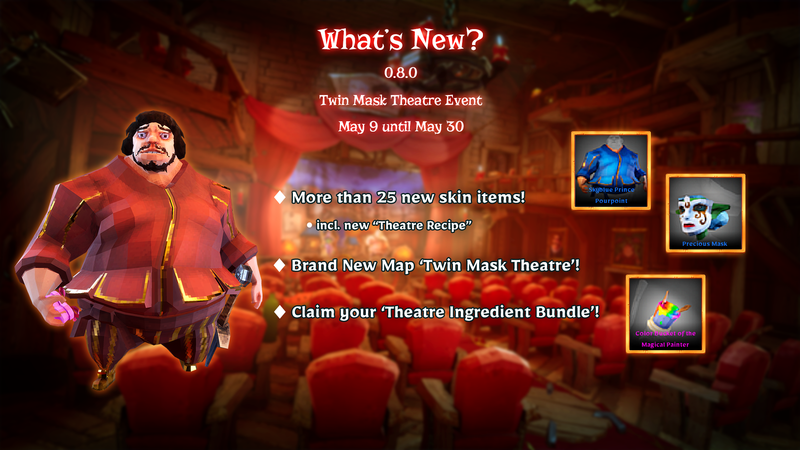 This means the ‘String’ will not only drop on ‘Twin Mask Theatre’, but also has a 20% additional drop chance on any map. To celebrate the first Anniversary of Witch It we added “Legacy” witch & hunter items to certain level unlocks. You provided us with some feedback regarding the crafting system. We decided on a couple of points to improve the experience and prevent frustration. Please keep the feedback coming! -Changed: Reduced the range of Vacuum Trap from 8 meters to 5 meters. Increased the slow from 40% to 60%. -Fixed bounciness of the chicken. The Spring Fever event is over now. -Added hint for joining a running game. -Changed: Very basic controller support in user interface, but it’s still work in progress. -Changed: ‘Magic Dust’ dropping from hunters will fall to the ground now. -Changed: Removed “Time over!” text behind witches win message. -Changed: Various teleporter improvements. It is now possible to use the teleporter with the spectator, chicken and Luaq. Also the camera will be rotated correctly when leaving the teleporter. -Fixed invisible hunter and witch in customization and ingame. Additionally, changes to skins and skill selection will be correctly saved now. -Fixed: Sound slider shouldn’t break anymore after tabbing out of the game. -Fixed: “Connection lost, please reconnect to steam” should not appear for some users anymore. -Fixed: Player input will work again when being caught as witch while in the settings menu. -Fixed: Instead of showing an empty drop, the cauldron will now remain full when the server item grant doesn’t work. -Fixed: Receipt drops will be shown correctly instead of two time. -Fixed: Decoy will be properly cancelled by the garlic (magic blocker). -Fixed: Prop highlight won’t stay when transforming from witch into a prop. -We had to revert on small fix, stabilize the servers. -Changed: Updated Prop Collection UI, not collected common items will be greyed out and not collected secret/event items will be question marked. -Fixed: Spectator positions are now synced correctly, so you can see the ghosts moving. We re-enabled Snowbreeze because we fixed the Black Screen bug. We temporarily disabled Snowbreeze in random map cycle, because it looks like it is causing the Black Screen Bug. The Winterdream Event has ended. We did another attempt at fixing the Disconnect at the end of the round bug. The bug is hard to reproduce, that’s why we are not sure if it’s really fixed. If you still encounter this bug please let us know in our Discord. -Fixed: Stuck in Loading screen on authentication failure. -Fixed: It’s now possible to find all props. -Added some Logoutput to the servers which will help us to get more info about the black screen bug. With this info we will be able to fix the bug later today with a Server patch. -Changed: Each region will now have 2 Snowbreeze and Fiskersted maps open until the end of the event. Updated to Unreal 4.18.2 in an attempt to fix the connection lost when you transform into a prop. If you still encounter this problem please let us know on Discord. There is also an attempt to fix the Server Crashes at the end of the round. The ‘Winterdream Festival’ has begun! Our gifts to you are hidden in the game – enjoy prop hunting! -Added: New feature ‘Prop Collection’ incl. rewards (first version, it will get expanded in the future). Collecting props is restricted to dedicated servers only, you cannot collect props for your Prop Collection in custom games. -Changed: Dedicated servers will now work correctly with the steam server system. This fixes various inconsistencies such as people can still connect if the server is full and a player count of 0 on each dedicated server in the server browser of the steam client. An addition to this is also a proper client server verification, which will prevent people with an unrightful version connect to official servers. -Fixed: Spring pad will now despawn correctly. All remaining ‘Ectoplasm’ will be converted for you the next time you start the game. The Halloween Event will be extended until November 29th. This Update has such a big file size, because we did small changes to all maps. Due to a fix to the Config system your selected Skins (Hunter and Witch) are resetted to default. This is only a one time issue and shouldn’t happen again. and add a small description on when the crash did occur. -Added a way to get rid of your spare ectoplasm: you can now craft random items out of them. -Changed the lighting system of all maps. We are using volumetric lightmaps now. They will make the lighting between characters, props and environment more uniform and cost less cpu performance, but a bit more gpu performance. -Changed: Adjusted lighting and fog settings of most maps. -Changed Witch and Hunter Customization Screen. They are more fitting now. -Changed: Removed experimental Vulkan support. -Fixed: Accepting an invite via steam should now send you to the correct game. -Fixed flickering ocean at the Island maps. -Fixed a crash related to the sound volume sliders. -Fixed easter egg props laying around in some layouts. -Fixed: Screenshot key no longer crashes the game. -Fixed: All key bindings showed “Not Set” sometimes when joining a game. -Fixed: Enhanced bounce physics of several skin items. -Fixed tomato brightness in shadow. -Fixed a bug where the Oculus Rift interface will open when you start Witch It. -Fixed chest and barrow prop teleportation. 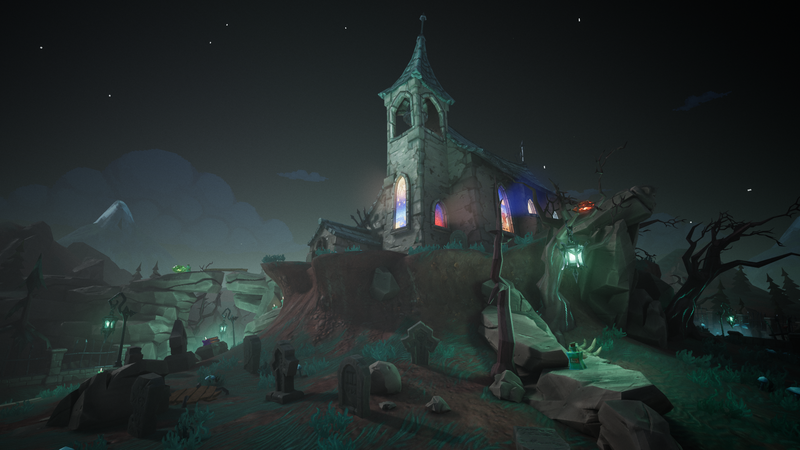 -Added ‘Sleeping Rose Cemetery’ Map with lots of new props. -Added 24 new Halloween themed Skin items, which can be unlocked during the Halloween Event. -Added 2 new skills: ‘Clingy Luaq’ for witches and ‘Vacuum Trap’ for hunters. -Added trails to hunter potatoes so it’s easier to see them. -Changed: Witches will now drop at least 1 ‘Magic Dust’ after getting killed. -Changed: ’Decoy’ will now spawn a random prop instead of the same prop the witch is controlling. -Changed: Improved the handling of ‘Decoy’: Added outline to the decoy only visible for the owning player. Decreased friction of the decoy props to make movement with flat props smoother (book etc.). Further improved the controlling of decoys, when moving behind a wall. -Changed ‘Magic Blocker’: Increased the range from 12 to 14, reduced the fly speed from 3000 to 2000 to improve recognition if it gets pulled by a witch. Adjusted the pull logic.The pull strength is now increasing while the ‘Magic Blocker’ is flying instead of being determined by the distance to the witch. It will now lose its target when reaching a certain distance to the witch. -Changed: Updated outline shader; Improved visuals and costs less performance. -Changed: Enabled anti speed hack system for dedicated servers. -Fixed: ‘Magic Dust’ will not spawn from hunters after the round has ended. -Fixed: ‘Fly’ sound will now stop when transform from witch into a prop. -Fixed Spectator size. Spectators will always have the same size now. -Added: Magic Dust. Magic Dust can be collected during a match and provides bonus XP. For Witches the Magic Dust will drop randomly during a game. If a Hunter catches a Witch, she will drop the amount of Magic Dust she collected so far, but without losing her own Magic Dust. -Added new Level Rewards for certain levels. -Changed: Skill system got overhauled. It is now possible to use 2 skills instead of just 1. The skills are now splitted into the categories “Movement” & “Utility”. The player will be able to choose 1 “Movement” skill and 1 “Utility” skill. With default controls press [Q] for the “Utility” skill and [Right Click] for the “Movement” skill. -Changed: Unified mana regeneration, now it is not determined by the skill anymore, instead, every witch has now a mana regeneration of 6 per second. Rebalanced mana cost of all skills according to the new mana regeneration. -Changed skill unlock system: The skills are no longer unlocked per level but instead per rounds played. They are unlocked quicker now to give more gameplay options. -Changed: Reduced the time until the mushroom cloud disappears from 4 to 3 seconds and reduced the time the hunter will be confused after leaving the mushroom cloud from 1.5 to 1 seconds. -Changed: Added a passive to Body slam, so that hunters can jump 50% higher and have 600% more air control. -Fixed: The Mushroom cloud is blocking the possess skill. -Fixed: Possess through open doors is working now. The summer event has come to an end. Thank you for participating! As the event has ended, now you are no longer able to obtain Iridescent Shards or Shells. All your remaining Shards and Shells will be converted at the first time you start Witch It after patching. It may take a while so please be patient. -Fixed stuck in environment: Hunters and Witches should no longer get stuck in the levels, if it’s still happening please tell us in the Discord Bug channel. -Changed “Kula Kula Islands” middle area. It’s now accessible. -Changed Event screen a bit. -Added bot detection, if a hunter will not participate properly, the server will kick him at the end of the round. -Added option to disable Idle kick in custom games (this includes bot detection as well). -Added option to disable hunter stamina in custom games, so the host can decide if the hunter can spam potatoes. -Changed: Increased the idle time before kicking from 30 to 45 seconds. -Changed: Optimization in physical collision detection, only props controlled by witch will use the complex collision detection (CCD) now. -Fixed: It should not be possible to block the spawn door with non witch props anymore. -Fixed: Charge sound for melee should now scale with sound volume correctly. -Fixed: Fly sound should be stopped now when transforming from witch to prop. -Fixed: Decoy should now be scaled correctly. -Fixed wall bouncing potato on certain surfaces. -Fixed: Steam voice should now be completely disabled for now, there should be no “ghost voices” for one frame anymore when someone connects (It also might fix some performance hitches on AMD CPUs, please let us know about that). -Fixed: According to DirectX crashes on some systems, a fix from the newest Unreal Engine version has been merged. -Added some shirts for you to collect. -Added a delicious new hidden prop. -Added mute player functionality, you can access it from ingame menu. -Added option to disable chat in game settings. This is mainly for parents who want protect their children from offensive ingame chat. -Added simple automated idle kick. -Added a filter function to the server browser, you can filter by official and custom server. -Added a kill message when you get killed as a witch. -Changed Morgenstund map: The visuals of the hole in the Start zone of Morgenstund are now fitting to the collision mesh. Additionally, we added rocks to the map to improve gameplay as well as visuals. -Changed: Removed vote kick on dedicated servers. This is now intended to be replaced by other mechanics like mute player & automated idle kick. More improvements/additions are already planned (e.g. better experience calculation). On custom servers, the host can still start a kick vote. -Changed: In the hide phase, damage is now disabled. Additional, skills will not affect the other team in negative way in hide phase (Chicken will not reveal witch, magic blocker will not block magic, mushroom cloud will not confuse hunter). -Fixed “Visual C++ Redist not found” issue, by including the dlls directly into the game. -Fixed Camera view when you possess into a hanging lantern. -Fixed certain sound volumes like “Body Slam” and “Hook”. They were not affected by volume change. -Fixed: Experience sound should not loop all over the time anymore. -Fixed: Chicken should not block possess skill and decoy skill anymore. -Fixed: Random timer should not restart anymore when player joins. -Fixed Errors like “lost connection” or “idle kick” should show up correctly instead of one frame. -Fixed visibility settings on some broken materials. -Added a simple sort function to the server list. You can now sort by server name, map, game mode, ping and player count by clicking on the appropriate head column. -Changed the range of “Body Slam” from 3 to 4 on small impact, 4 to 6 on medium impact and 6 to 8 on large impact. Additionally, the damage got increased from 10 to 12 on medium impact and 14 to 18 on large impact. -Fixed 0 HP display bug. -Fixed: It’s not possible anymore to heal to full HP when using “Possess” skill as a witch. -Fixed: “Body Slam” will now use a fixed offset. -Fixed max level progression by hiding the progress bar and showing a label instead. Also, it should not be possible anymore to temporary exceed max level for the game session. -Fixed: It’s not possible anymore, that multiple people can possess the same prop. -Added “Body Slam” skill for the hunter (unlocked at level 15). With this skill, the hunter can use his mass to deal AoE damage. -Added “Possess” skill for the witch (unlocked at level 13). With this skill, the witch can become an existing prop, so that she will move directly to its location. -Changed: Decoy will now spawn the prop you are currently mimicking. -Changed: Decoy activation cost increased to 20, cost per second decreased to 4 and mana regeneration increased to 10 per second. Overall the decoy can now stay active for 20 seconds. -Changed: Magic Blocker gets now pulled by magic like a magnet. -Changed Melee Attack in various ways: Increased the cooldown to 0.5 seconds and added a charge, which can be used to push props and to hit witches hiding in corners which are difficult to reach for the hunter. Fixed the range, so it will now hit props which are really targeted. -Fixed: It should not be possible anymore to use melee skill and throwing potato at the same time. -Added a new death camera, which shows more clearly that you just got killed. -Added volumetric fog to most levels. This improves visuals but decreases performance a bit. However, on low or medium settings it won’t be used. -Added a Keybinding for the active skill, so you can rebind it. -Added new Patchnote notifications, so you never miss a new patch. -Added unlock levels to unlock item descriptions. -Added a short blinking when the hunter hits a prop, so the player can clearly see which prop got checked. -Changed Cheese collision to prevent it from getting under the map. -Changed: Updated to Unreal Engine 4.16.2 which fixed e.g. the bouncing chicken. -Changed: Countdown should not reset anymore on dedicated servers if someone joins. -Fixed 0HP prop health. The number will not round down anymore. -Fixed: Moved Notifications into its own savefile. As a result you have to click all your notifications for new items once more but never again. -Fixed: Spectators can see witches in Mobification on dedicated servers. -Fixed several item description errors. -Fixed: Game messages should fade out correctly now. -Fixed: Chest and barrow should work correctly for clients now. We didn’t do too many changes this patch to see if there are new bugs because of the switch to the new unreal engine version. -Changed: Updated to Unreal 4.16.1. This should fix several bugs and improves netcode. -Changed: As an attempt to prevent Ghosting we changed the visibility of witches for spectators on dedicated servers. It can still be enabled on player hosted games (custom game). -Changed random player selection. You won’t be 4 times a hunter in a row anymore. Each time you are on one side, the chance of being the same side again is reduced. -Changed the shuffle of Random Map Cycle, the chance is higher to get different maps now. -Changed: Adjusted quickmatch to rather join dedicated servers instead of custom games. -Changed: “Vote Kick” will now show the name of who initiated the kick. The reason text got replaced by a defined set of reasons. The time has been increased from 60s to 120s before the same user can start another vote kick. On custom games, only the host can start a vote kick. -Changed the memory limit for dedicated servers from 300 Mb to 500 Mb, with this, the servers will last longer until they shutdown and restart. -Fixed: Server list showed games with 11/10 players etc. They are now greyed out. – Added: Re-enabled “The Chummy Potato” map. – Added a Stamina system to the Potato Throw, so hunters cannot spam infinitely. – Added a slight bounce to the potato e.g. to make it easier to hit props on tables. – Changed confusion time of the Mushroom skill from 3 seconds to 1.5 seconds. – Changed the time the Mushroom skill area exists from 3 seconds to 4 seconds. – Changed mana regeneration of the Fly skill from 20 mana per second to 10 mana per second. – Changed the speed of the potato from 50 to 60. – Changed the gravity of the potato from 0.5 to 0.3. – Changed the potato spawn location, it will now fly more according to the crosshair. – Changed several spots in “Morgenstund” including the Hunter start zone. – Removed: As a hunter, you were able to see the player name of the witch, if you stood right in front of them (while the witch was turned into a prop). This has been removed. – Added: The first map cycle is over. The playable, new maps are now “Grunewald Library” & “Morgenstund”. – Changed: Removed the 2 existing maps to test balance and map bugs on the 2 new maps. – Changed: For random team selection the game only starts automatically when at least 3 players are ingame. – Changed: Reduced time until next match starts from 30 to 18 seconds. – Fixed various spots in “The Chummy Potato”. – Fixed speed and health of the small pumpkin. – Fixed sound blast when using “Fly” skill. – Fixed clamped velocity of the “Fly” skill. – Fixed: Player count is now correctly displayed in the server browser. – Changed the way how sleeping props are replicated, which should fix certain prop issues (some props are popping on interaction, wheelbarrow glitches etc.). This is an experimental change. – Changed cooldown for transforming into other props from 0 to 0.5 seconds. – Changed maximum amount of taunts per second to 1, stacking up to max 10 taunts if not used. – Changed minimum resolution to 800×600. – Changed: Increased the maximum bandwidth use per player on the server by 50%. – Fixed house shader on low settings. Houses are no longer transparent on some Intel Gpus when settings are at low. It will still occur on higher settings. Updating the Gpu driver should fix this. – Fixed: Witches could transform into the same prop. – Added 3rd person camera to the Hunter. Default key binding is “T”. – Added Mobification (Infection) Game mode. – Added Max hunters option for random team selection mode. – Added visual and audio notification when a phase is about to end. – Changed Hunter skin back to default skin. – Changed Winter Dream Map: removed the christmas theme. – Changed: Removed standard prop layout of the map and have 5 layouts instead. – Changed: reduced the health of the book. – Changed: reduced hide time from 30 to 20 secs. – Changed: increased search time from 3 to 4 mins. – Fixed: Hunters were able to move under the map when the plank at the doors disappeared at the start of the seeking phase. – Fixed more broken map hiding spots. – Fixed jumping wheel on the barrow. If it’s still happening please let us know. – Fixed: Reverted physical movement is being calculated on server only because it leads to Server sleep out of sync issues. – Fixed: SteamVR is no longer starting when the game starts. – Added an experimental gamemode for more variety in gameplay. Select it in custom match. – Added Fullscreen and VSync option. – Added new easter egg props in random layouts. – Added the option to sign up for the Holiday gifts in main menu. – Changed: plate nerf: reduced health and speed also texture is now brighter. – Changed: reduced apple and pear health. – Fixed the glitch where hunters could look through the ceiling in start zone. – Changed physical movement is now being calculated on server only leading to less jitter on client. – Fixed game was not ending after last witch died. – Fixed timer in random is not working properly. – Added spam protection in chat. – Added character limit in chat. – Added closing chat by using escape. – Added second bounce pad to the map. – Added patch notes to mainmenu. – Changed maximum amount of hunters to 4 in random team selection mode. – Changed apple and pear size. Both are bigger now. – Changed: disabled camera shaking and rolling in spectator mode. – Changed maximum amount of players to 16 instead of 48 (sorry, but the experience really suffers with 48 players). – Fixed deactivated player list (using tab) after joining into another game. – Fixed lock function is being triggered when using shift if chat is open. – Fixed timer for random team selection mode. – Fixed game restarting if player leaves in team selection (especially in random team selection mode). – Fixed many small hiding spots on the map. – Fixed Music and sound volume saving. – Fixed back button double click in KeyBinding settings.